Detail from the stained glass window at Birkenhead Central Library. Designed by David Hillhouse. One story often leads to another. On my visit to the war memorial at Port Sunlight, please see previous posting, I was very much reminded of the Poet, Wilfred Owen whose words surround the base of that monument. I first found out about Owen’s poetry when I was doing my English Literature GCE O level. What fascinated me most about his poetry were his references to Christianity. Indeed, one of the very few poems that I’ve ever been able to recite was his ‘At a Calvary near the Ancre’. Before my GCSE exam, I knew that I would have to be able to remember at least one poem, this one was perhaps a little outside the mainstream; everybody else was choosing either ‘Anthem for Doomed Youth’ or ‘Dulce Et Decorum Est’. ‘At a Calvary near the Ancre’ identifies the hypocrisy within the church at that time alongside Owen’s own struggle to reconcile the Christian faith against the horrors of war. All this is 100 years ago now and thankfully the church has moved on, and, if nothing else, has learnt and continues to learn from its past mistakes. 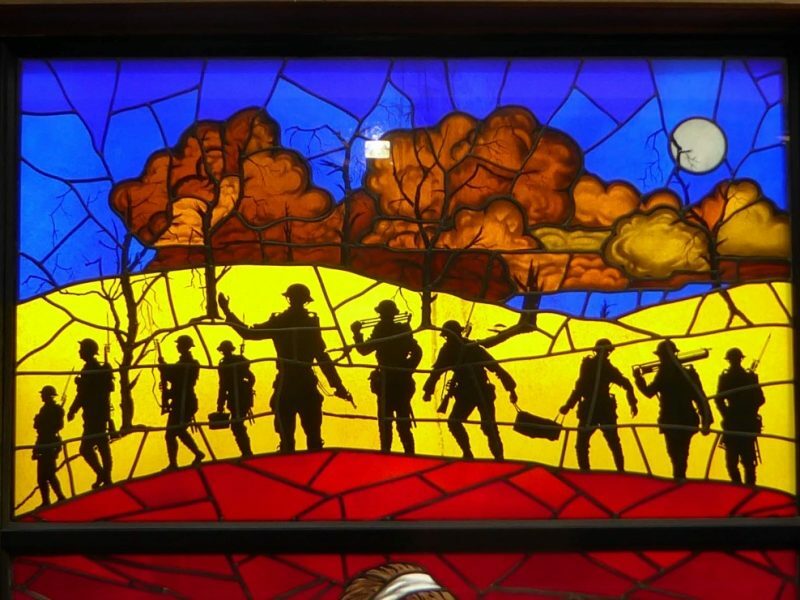 The horrors of the war clearly challenged Owen’s Christian beliefs, but whilst he was critical of the stance that the church had taken both over the war and with its role in society, I’d prefer to believe that he himself didn’t lose his faith. Indeed, in a 1917 letter to his mother, he wrote “Christ is literally in no-man’s-land. There, men often hear His voice”. Owen questions whether Christ’s voice is only heard in English and French. He then goes on to say that “Pure Christianity will not fit in with pure patriotism”. The 4th November this year, will mark the centenary of Owen’s death. So now is a good time for me to pitch a proposal to a magazine for an article on his early life. Born in Oswestry, Owen is mostly associated with Shropshire, however, for an important seven year period, his family lived in Birkenhead and the town has much to show for the Poet’s early life. It was whilst he was here at school that his love of poetry was born. Last week I visited the Wilfred Owen Story at 34 Argyll Street, Birkenhead. The exhibition here has numerous displays which include copies of some of his letters and personal artefacts relating to his life and family. 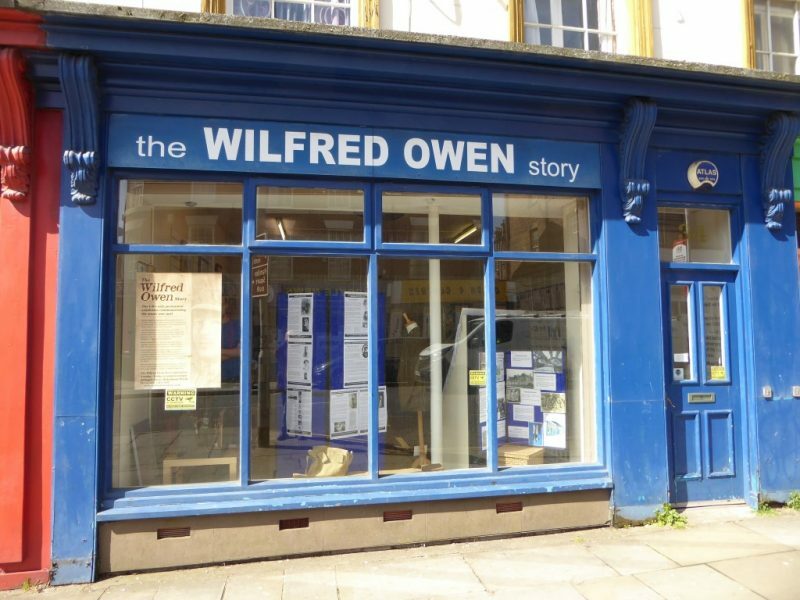 For anybody who is interested in Wilfred Owen or who may wish to discover him for the first time, then the exhibits here will give you a fascinating insight into his life. His father was the Station Master at Woodside Central Station. The young Wilfred attended school at the Birkenhead Institute and the family went to the local parish church of Christ Church. Between 1900 and 1907 the Owen family lived in the Tranmere area of the town, moving house on two occasions. At the exhibition I picked up a leaflet giving a map for the Wilfred Owen trail, this passes each of the three houses where the Owen family lived, along with the church, the site of his school, and also Birkenhead’s central library. The library is particularly worth a visit because it has an impressive stained glass window on its central staircase dedicated to Owen. On the landing area there are also further displays to commemorate Owen’s life. It is a sad irony that only in this last week, the UN has been discussing the use of chemical weapons in Douma, Syria, ten miles north of Damascus. Owen’s famous poem, ‘Dulce Et Decorum Est’, graphically portrays the use of such a weapon. If he were with us today, I wonder what he would be thinking. One of the lessons that mankind learnt from Owen’s war was that this sort of weapon should never be used again. Despite it being 100 years on, it now seems that not all men learn from history’s lessons.